JoAnna Garcia will become part of the Once Upon A Time world. Once Upon A Time titles announced include The Heart Of The Truest Believer, Lost Girl, and Quite A Common Fairy; Wonderland titles include Down The Rabbit Hole and Trust Me. Hook Or Neal: Who’s The Better Match For Emma On Once Upon A Time? Details and videos from the Once Upon A Time Season 3 panel at Comic-Con. 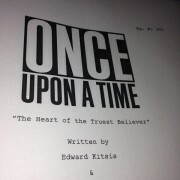 The Once Upon A Time Season 3 premiere will be called The Heart Of The Truest Believer. 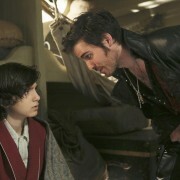 Once Upon A Time episodes 2.10 and 2.11 will be called The Cricket Game and The Outsider.